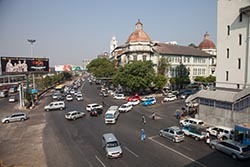 Downtown Yangon is known for its leafy avenues. The former British colonial capital has the highest number of colonial period buildings in south-east Asia. Downtown Yangon is still mainly made up of decaying colonial buildings. 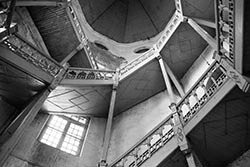 The former High Court, the former Secretariat buildings, the former St. Paul's English High School and the Strand Hotel are excellent examples of the bygone era. Despite their less-than-perfect conditions, the buildings remain highly sought after and most expensive in the city's property market. We took a flight from Heho airport and landed at Yangon International airport mid-morning. As at all destinations we visited, our local guide and the bus was waiting for us. 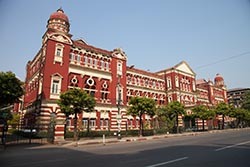 We would be in Yangon for 2 nights and were booked at Kandawgyi Palace hotel, a luxurious property in the heart of the city, opposite the zoological gardens and on the banks of Lake Kandawgyi. It took us about 90-minutes to reach our hotel. 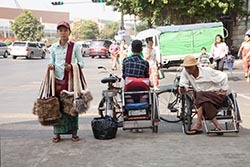 Within Yangon city limits, it is illegal to drive trishaws, bicycles, and motorcycles. And, interestingly, the car horn is banned. In rush hours, which is almost throughout the working day, traffic snarls can indeed be very irritating. We set out that afternoon. On the agenda was visiting Chaukhtatgyi Paya (Pagoda) and the famous Shwedagon Pagoda. The highlight of the evening was lighting of the oil-lamps at Shwedagon. The Chaukhtatgyi Pagoda houses one of the most revered reclining Buddha images in the country. 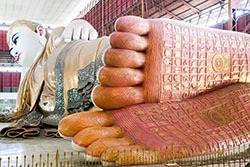 The Buddha image is 66 metres (217 feet) long, and one of the largest in Myanmar. 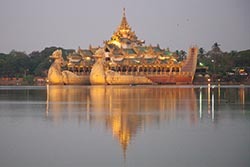 The construction was sponsored by a wealthy Burmese Buddhist, Sir Po Tha, in 1899. The image was completed in 1907 by another construction company, but was not proportioned correctly, and the Buddha's face had an aggressive expression. In the 1950s, the old Buddha image was demolished and temple trustees began work to replace the image, under the supervision of U Thaung, a master craftsman from Tavoy (now Dawei). Large glass eyes with dimensions of 1.77 by 0.58 metres (5ft 10in × 1ft 11in) were custom-created at Naga Glass Factory. The Buddha image was consecrated in 1973. 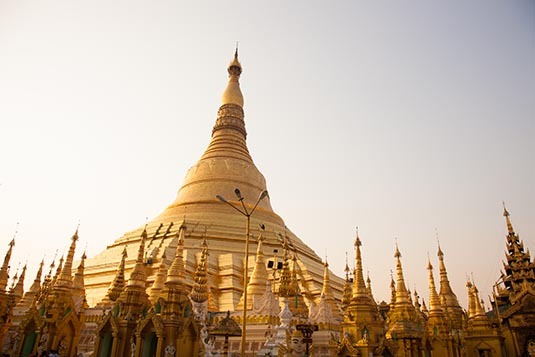 No visit to Myanmar is complete without a visit to the 2,500 years old Shwedagon Pagoda, which enshrines strands of Buddha's hair and other holy relics. Located west of the Royal Lake on 114-acre Singuttara Hill in Yangon, Shwedagon Pagoda is the most sacred and impressive Buddhist site for the people of Myanmar. From a humble beginning of 8.2 meters, the Shwedagon Pagoda today stands close to 110 meters. Shwedagon Pagoda is covered with hundreds of gold plates and the top of the stupa is encrusted with 4531 diamonds; the largest of which is a 72 carat. It is clearly one of the wonders of the religious world. Shwedagon Pagoda is a repository of the best in Myanmar heritage – architecture, sculpture and arts. The Shwedagon Pagoda consists of hundreds of colorful temples, stupas, and statues that reflect the architectural era spanning almost 2,500 years. To understand this monumental work of art and architecture, visitors will experience an insider's view of this magnificent symbol of Buddhism to the lives of the Myanmar people. Shwedagon Pagoda forms the focus of religious as well as community activities – the bustling of devotees and monks washing the statues, offering flowers, worshiping, and meditating. At each corner of the octagonal pagoda is a shrine with a Buddha image (one for each day of the week, Wednesday is split into two). Every shrine has a planet and an animal sign associated with it in accordance with Eastern astrology. Burmese people pray to the shrine belonging to their day of birth burning candles, offering flowers and pouring water over the image. Since I was born on a Sunday, I paid my respects at ‘my’ statue. At sunset, we had opted (for a fee) to light the oil lamps. Over 500 of them were neatly arranged around the pagoda and took the opportunity to light them all – symbolizing moving towards a brilliant future and away from darkness. Amen. The next morning we would be taking a walking tour of the era bygone. Since we were to move mainly in the colonial district, a little history is quite in place. 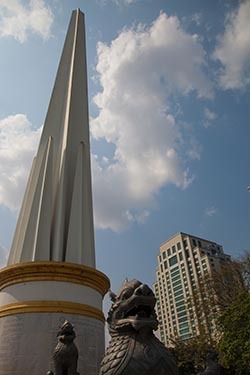 The British seized Yangon and all of Lower Burma in the Second Anglo-Burmese War of 1852, and subsequently transformed Yangon into the commercial and political hub of British Burma. Yangon is also the place where the British sent Bahadur Shah II, the last Mughal emperor, to live after the Indian Rebellion of 1857. Based on the design by army engineer Lt. Alexander Fraser, the British constructed a new city on a grid plan on delta land, bounded to the east by the Pazundaung Creek and to the south and west by the Yangon River. Yangon became the capital of all British Burma after the British had captured Upper Burma in the Third Anglo-Burmese War of 1885. After World War I, Yangon became the epicenter of Burmese independence movement, with leftist Rangoon University students leading the way. Three nationwide strikes against the British Empire in 1920, 1936 and 1938 all began in Yangon. Yangon was under Japanese occupation (1942–45), and incurred heavy damage during World War II. The city was retaken by the Allies in May 1945. Yangon became the capital of Union of Burma on 4 January 1948 when the country regained independence from the British Empire. The grid system of roads makes it quite easy to find addresses and navigate around. We commenced our walk on the Strand Road. From there on it was a 2-hour walk that took us along many historical buildings. The trip felt as if I was walking in Fort area of Mumbai which also imparts the colonial charisma. We ended our walk at the park opposite the City Hall and the Sule Pagoda. We waited for our bus to pick us up and move towards Aung San Market. We were given an hour to explore this bustling market that had shops selling, jewelry, local handicrafts, silverware, garments and local works of art. Myanmar is famous for its jade; but I suggest not buying them from just any store. It’s quite likely that tourists may be passed some inferior stuff. After a brief rest at our hotel, we visited the royal barge on the Yangon River, also the location of Botahtaung Pagoda that’s enshrined with the sacred hair of Lord Buddha. We enjoyed the sunset on the banks. We preferred to be dropped at the entrance of Kandawgyi Lake and walk on the raised wooden board encircling the lake. A good 30-minute walk over the serene lake got us to our hotel gate. The next morning we would head home; ending a beautiful 10-day trip to Myanmar.